Today I have a different kind of review: that of a songbook! I greatly enjoy the music in this book, and thought it would be fun to share it with you! Let’s get on to the review, shall we? 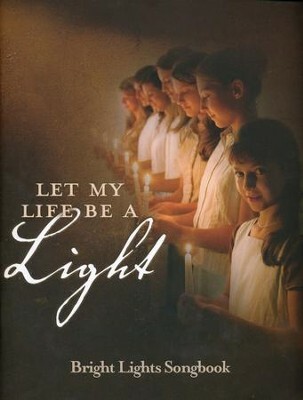 “The Bright Lights songbook was designed as a companion to the CD Let My Life Be a Light, released in November of 2009. It contains the piano accompaniment, guitar chords, words, and melody line for each of the songs on the CD, with vocal harmony added to several of the songs. Five additional songs were included in the songbook that are not on the CD. Recommended age range: Intermediate-Advanced pianists. In Christ Alone is written by Keith Getty and Stuart Townsend. I haven’t listened to a lot of music by them, but from my understanding, they (at least Mr. Getty) are very much CCM musicians (correct me if I’m wrong; like I said, I haven’t listened to him). Amazing Grace, on the other hand, was written by John Newton. He lived a long time ago (like in the 1800s), and was definitely not a CCM artist. I don’t know much history on Come Thou Fount, but I think it has a similar backstory to Amazing Grace. While I agree that In Christ Alone has some very moving words, and I agree with most, if not all, of the words, I just don’t want to support the CCM crowd. Also, when I hear people sing In Christ Alone (I heard it at a wedding once), they seem to have very sensual tones (and I realize that it’s probably very “toned down” from normal CCM music). I just don’t agree with that. The way we sing Amazing Grace and Come Thou Fount, the focus is on God, not on whoever is singing it. I don’t necessarily agree with the tone thing because many people sing their hearts out to the Lord, but I think makes sense overall. Do you know what sensual means? One thing you should also consider is that man is sinful, and they can use anything improperly, which includes the Bible. Man constantly twists scripture to the way they want it to be, disregarding other parts. Should we then stop using the Bible? I wasn’t there at the wedding you mentioned (obviously xD), so I can’t speak for those there. But my overall thought is that the song should be judged on its’ on merit, not on the actions of an unauthorized party. Sorry if it appeared that I was trying to argue with you. I was trying to understand your point of view. Sometimes when people try to explain things to me, I just can’t understand what they’re saying (and Leah knows this all too well xD). I probably didn’t really go about this correctly since I was trying to share what I believed as well (this is pretty much one of my first times having a debate of sorts with someone, so I probably was oblivious and clueless). Ooh, I want this hymnal!!! I didn’t know that bright lights had a song book; that’s so cool! Yes, CMM is definitely NOT cool… But I still like the song In Christ Alone. The only song that I don’t like as much is The Smile Song. This is a cute song, and most of the words are great, but I believe that it says in the chorus, “A smile, a smile, makes my life worthwhile…”. It’s not smiling that makes our life worthwhile, it’s Jesus! (: We have made up other versions of the song and changed around that sentence before, though.